Welcome to May, everyone! At long last, all signs point to the arrival of spring: sunny days, warmer temps, birds chirping and plenty of runners hitting the local trails. One of the most popular running trails is the Oak Leaf Trail, which extends through Milwaukee County and beyond. It’s a local running gem but it could use a good spring cleaning. That’s why several Milwaukee running groups are teaming up for the 4th annual Oak Leaf Trail Cleanup! Below, Patrick Bieser with Milwaukee Running Group OMG, tells us more about the upcoming cleanup. Can you tell us a bit about the event? People who pick up trash in public places live longer, have fewer cavities, and enjoy that good feeling and glow you get when you do something good for the planet. The 4th annual Oak Leaf Trail Cleanup is one of those planet-friendly, guaranteed-to-make-you-glow events. The cleanup will be held Sunday, May 6 from 1-3:30pm and will focus on a mile long stretch of the trail near Colectivo at the Lakefront. We expect over 100 people of all ages to gather on the lawn north of Colectivo starting at 1pm. We will return from the trail – with trash-filled bags – around 3:30pm. All volunteers are welcome to stick around and enjoy free snacks and beverages on the lawn. This is a family, kid, and dog friendly event. Friends are welcome, too! It’s great to hear several running groups are coming together to clean up the trail. Which groups are participating in this year’s clean up? And can people still join in if they’re not a member of one of these groups? 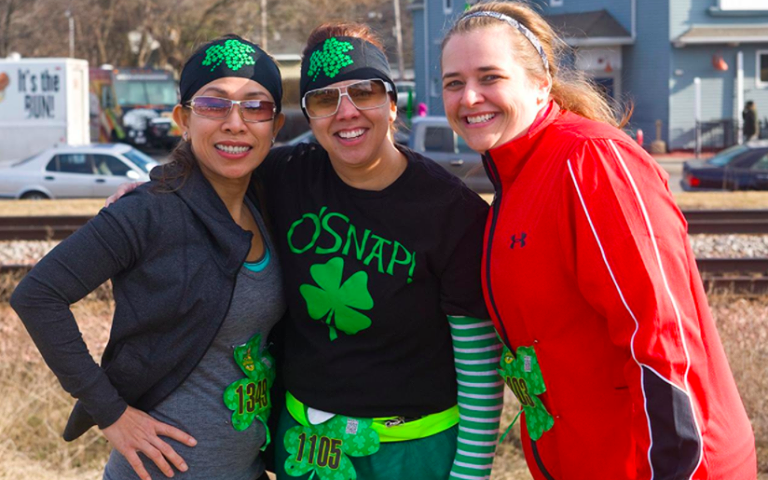 The Milwaukee Running Group OMG is excited to team up again this year with Badgerland Striders, Tri-Wisconsin, Splinter Striders, and members of the November Project. You do not need to be a member of one of these groups to participate. In fact, this is an excellent chance to learn more about these groups and meet their members. These groups are the most active running, biking and workout clubs in Milwaukee offering year-round fitness activities for insanely cheap membership dues, or free-forever in the case of November Project! What makes the Oak Leaf Trail such a valuable community resource? The east side segment of the Oak Leaf Trail is busy, 16 hours a day, with bikers, runners, dog walkers, and occasional raccoons, wild turkeys and deer. It’s a Milwaukee treasure, and one of the reasons we love running and biking here. The trail is 120 miles of railroad bed converted to smooth asphalt circling Milwaukee and showcasing our neighborhoods and charms. Why should people come help out for a few hours? When a friend has a problem, you don’t turn your back. The east side Oak Leaf Trail has a trash problem every spring (a winter hangover) and it needs your help. Other groups have walked the trail in the past few weeks picking up trash, but they’ve missed most of the harder to get to places along the trail. We’ll tackle those spots because we’re runners and we don’t give up easy! As a bonus, we’ll ask people to keep track of the most interesting things found during the cleanup. 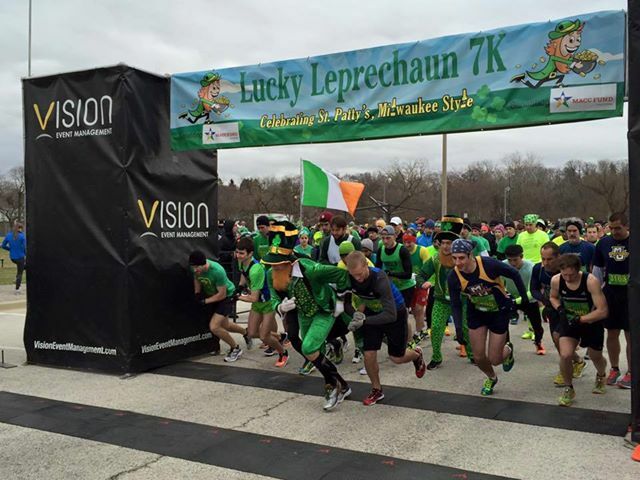 Take a picture and send it to mke.run.group@gmail.com or post it to the public event Facebook Page. Do volunteers need to bring anything? OMG and Badgerland Striders will provide trash bags, trash-pickers, logistics, and a free picnic after on the lawn outside Colectivo. Volunteers should bring work gloves and clothes to get a little muddy. Recent drainage improvements to the trail have reduced the puddles that lined the trail in past years, but there is still mud! The costs of the cleanup will be covered by The Milwaukee Running Group, Badgerland Striders, and the Keep Greater Milwaukee Beautiful organization. Are you a runner or biker who uses the east side trail? Join us for a few hours of trail cleanup. Now is the time for all good people to come to the aid of the Oak Leaf Trail! Thanks for chatting with us, Patrick! This looks like a fantastic event and a great way to help keep our city and trails clean for everyone. To learn more, visit the Facebook event page. For many runners, late fall/winter is a time for rebuilding and getting ready for spring races in the upcoming year. This year, why not make strength training part of your routine? Performance Running Outfitters is once again offering it’s popular 8-week strength program, which is designed to help you become a stronger, faster, more efficient runner. Each class begins with a 25-minute runner-focused body weight workout that will engage and challenge your running muscles. The classes will finish up with a 2- or 4-mile run. All levels of runners are welcome, including those who are not comfortable running 2 or 4 miles. Shorter routes will be available to accommodate all participants. In addition to a great strength/run program, participants will receive a pair of technical running socks and a winter beanie. Classes are taught by PRO’s in-house coach, Nicole, who is a certified coach and personal trainer.